this is incredible (and scary)! Oh these are incredible! He must gt such a thrill. gorgeous photos! nature amazes me. wow those are absolutely incredible pictures!!! Are you kidding? Those top two shots are crazy! It looks like the Close Encounters spaceship. Great BLOG i read your posts often...LOVE THEM! wow i definitely looked around his site for wayyy too long haha AMAZING! Mike lives in my town! I haven't met him, but I know his work. I have purchased a DVD of his stuff. I LOVE weather and secretly want to be a tornado chaser when I "grow up". Thanks for helping to spread his talent. wow ~ such dynamic work! his blog has no rss feed. that is sad. Nice pictures! They are truly amazing! 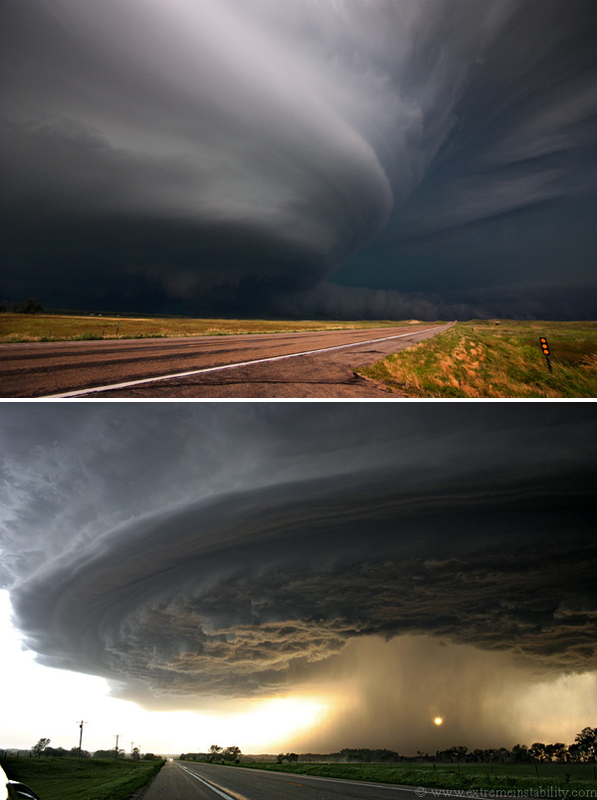 Good Lord that second photo looks like the end of the world or something! WoW! Ooops...I just posted the wrong website with my comment. It's a cool storm picture site, (not mine at all) but nonetheless. oops! wow that's amazing (& beautiful)! Wow, the clouds look like sculptures! Great find! Thank you for sharing, the photos are out of this world!